So, what have I got? What are the tools of the trade? Well, I've already found out that (excusing the pun) astronomy as a hobby is a massive black hole for any spare cash you have. So, starting on a modest budget, here'y my current kit list. 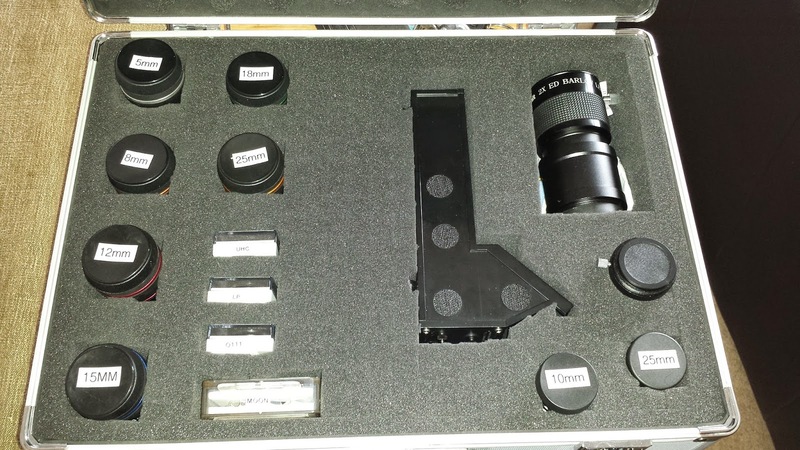 Skywatcher Explorer 150p telescope with 2" Crayford focuser with 1 1/4" adaptor. 23mm, 18mm and 8mm BST Starguider EPs. x2 ED 2" Barlow with 1 1/4" adaptor. 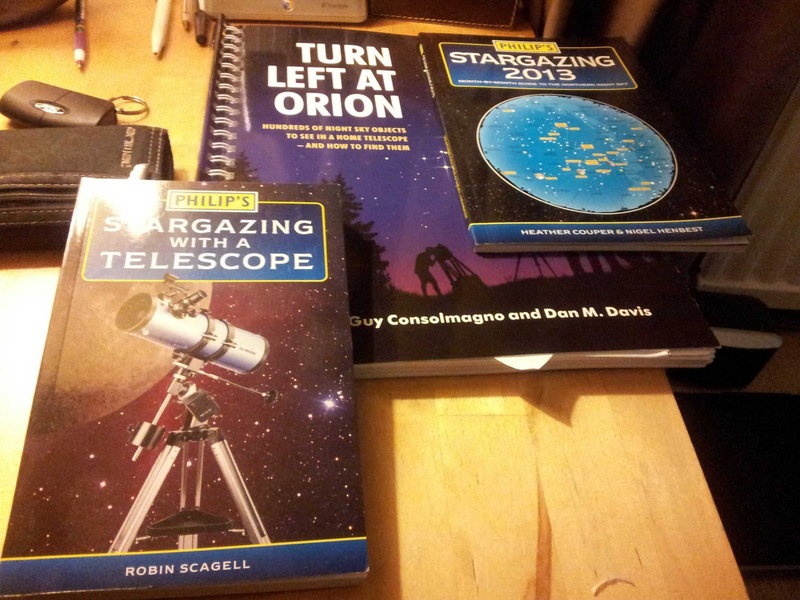 A few books, namely Turn Left at Orion perhaps the most used thus far. Along the way, I've found many resources and suppliers to plunder for information and new toys. Namely, First Light Optics who helped me with deciding which scope to buy, and then duly sold me that scope. Next, Skies The Limit. This is primarily an eBay shop run by a chap called Alan. I bought my EPs from him and he seems to be the sole stockist of the BST Starguider/Explorer EP that I can find in the UK. Fantastic customer service and definitely worth checking out. I've signed up to the Stargazers Lounge astronomy forum. A great source of information and very pleasant people. They're very welcoming of all levels of experience and no question is ever to dumb. So, here is now the complete collection including a new, better quality barlow. 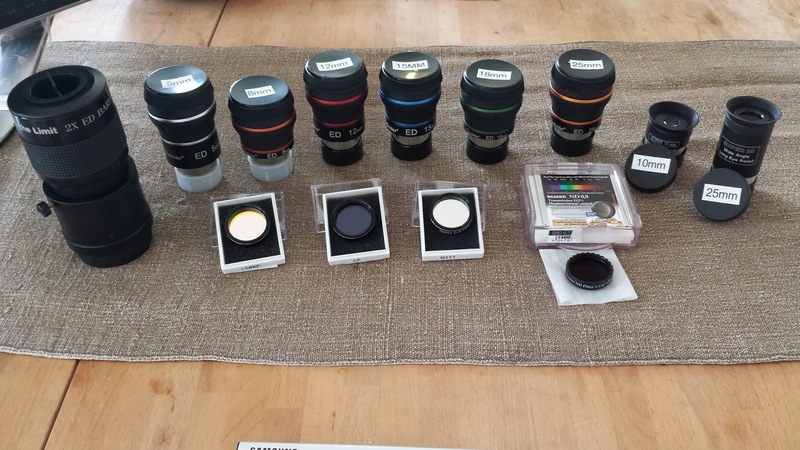 From left to right: x2 Barlow, BST Eyepieces 5mm, 8mm, 12mm, 15mm, 18mm, 25mm, Stock Skywatcher Eyepieces 10mm & 25mm. 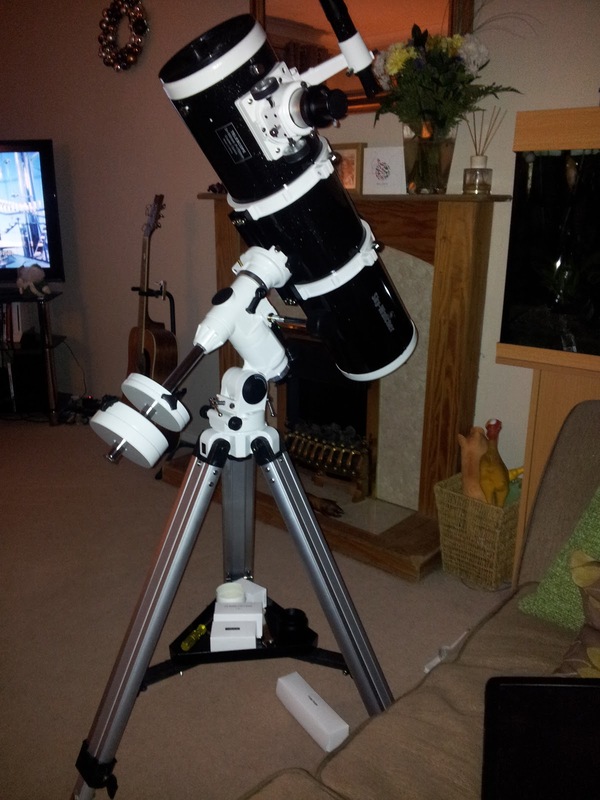 Front: Skywatcher filters UHC, LP, OIII & Baader moon filter. And all these are now kept in a foam filled case. I sourced the case from Maplins in one of their sales. They seem to be ideal thing to keep all this glass safe and secure during transport and storage. The foam has been cut to accommodate each of the objects. Also included are the Telrad finder and the stock barlow that came with the SW 150p.